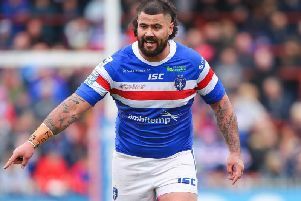 Adrian Lam hopes son Lachlan may follow him to Wigan next season - and help make them an “explosive attacking team”. Lam, who will serve as interim head coach next season, hopes to discover within the next two weeks whether the PNG international will be allowed to leave Sydney Roosters for a year in Super League to gain experience. The 20-year-old, who interestingly played his first matches for St Pat’s juniors, is highly-rated but has yet to play NRL as he is behind Cooper Cronk and Luke Keary. Asked about the prospect of Lachlan joining him at at Wigan, Lam said: “That’s still a possibility. He’s in negotiations with the Roosters and we’ll go through the process with it. “We’ll know within 10 days. I’m excited about him potentially coming here because he’d fit that style of footy that we want to play. “If you had Lachlan on the right and (George) Williams on the left, all of a sudden you become an explosive attacking team. Lam plans to speak to executive director Kris Radlinski before he heads back to Australia about “one or two” possible other recruits for next year – chairman Ian Lenagan told today’s press conference he and Radlinski take charge of recruitment and retention decisions. “The base there with O’Loughlin, Farrell and Leuluai, it’s a good base to work from,” said Lam, who coaches the Roosters’ Under-18s and is Australia’s assistant coach. “Hopefully I can recommend some players. The arrangement which sees Lam warm the seat for Shaun Edwards for 12 months is certainly unusual, but the 2002 Super League players’ player of the year insists he is comfortable with the interim role, which Lenagan believes will increase his chances of landing a top NRL role for 2020. And while he is holding the fort for one season, Lam vowed to make Wigan a more flamboyant attacking side. “I want to do things a bit differently, make an impact quickly and inspire them to reach their potential,” he said. “I knew from the start what my role will be. It won’t stop me playing the style I want to. Lam spent four years at Wigan as a player - “I have so many fond memories of the people, the town” - before starting his coaching career at the club in 2005, working in the academy alongside Shaun Wane. And he was full of praise for the current head coach, who will step down at the end of the season to join Scotland RU. “We did ‘05 in charge of the two academy teams, we won the 18s Grand Final and lost the 20s final, and what he has done here has been phenomenal,” added Lam. Meanwhile, Mark Bitcon will be leaving to join Premier League champions Manchester City at the end of the season. Wigan have previously confirmed head of youth Matty Peet is leaving for Sale and will be replaced by ex-player, and Widnes assistant coach, Mick Cassidy.